In Calabria is a romantic novella set in modern day Italy. It tells the story of Claudio Bianchi, a middle aged man who lives alone on his farm in pastoral Calabria, purposefully isolated from much of the modern world. The majority of his human interaction comes from the mail carrier, who braves Bianchi’s dirt road every day, and the mail carrier’s younger sister Giovanna who is learning the ropes. 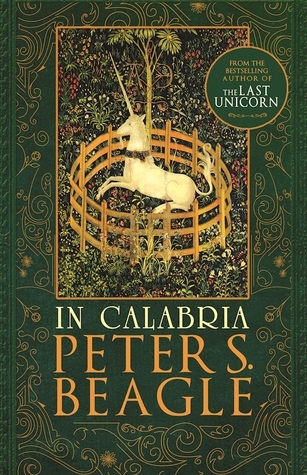 Bianchi finds friendship primarily with his animals, many of whom are as grizzled and curmudgeonly as he, until one day a magnificent unicorn appears on his property and changes his life forever. Bianchi suffered a great loss many years ago and has since secluded himself on his farm, with no company except his dog, cats, goats, and cows. But it becomes clear to him that this unicorn did not choose his land at random, and that heavy with a colt she will need him as much as it turns out he needs her. Eventually, reality and the times come crashing down Bianchi’s door, but he handles it poised and stoically, waiting for it all to pass. Bianchi’s life becomes even more complicated, though, when an unlikely friendship develops into something more, spilling over all the emotions the unicorn has brought to his surface. If this story sounds like a fairy tale, that because it is in a way. It is truly a romantic tale of love and loss and how hope never really abandons us. The animals as characters are phenomenal, especially given how Beagle builds their personalities solely through their actions and Bianchi’s reactions to them (no talking animals here). I feel obligated to comment on the stark age difference between two of the characters who become romantically involved, but honestly, it doesn’t bother me because both parties acknowledge it and choose to proceed anyway. Because really, age ain’t nothing but a number… it is situations where actresses are told they’re too old to play the love interest of someone in their own age bracket when there is a problem, for example.